Ok, so it’s really not hard to do, even though I like to think I’m neither ham-fisted nor boneheaded, and it was more like 40 tomatoes. But that’s what I ended up with. A large pile of tomatoes, about 4 hours of simmering. 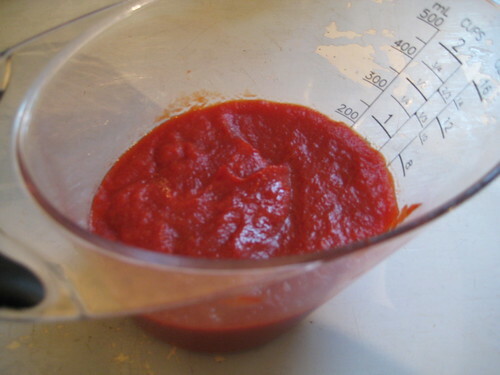 Less than one cup of tomato paste. Six ice cubes worth. I wanted to use up all the rest of the tomatoes that were sitting on (and spilling off of) my south-facing windowsill. I’d rescued what tomatoes I could from my doomed harvest, and decided to use them all up. Next time, if I really decide that this tomato paste changes my culinary life, I’ll use way more tomatoes, cause it seems like an awful waste of energy for six ice cubes of tomato paste. Anyway, yes, my tomato harvest is officially over. It was very rainy a few weeks ago, and the vines started to just rot. The tomatoes all started to fall off the vine even while still green. Or to get all mouldy while still on the vine. Or get all splotchy. I managed to save some, but a large part of my harvest is on the ground of the tomato bed in various stages of decay. It looks kinda sad, because I took out all the vines. I’ll rake leaves over the whole thing to hide the evidence until next spring. And the tomatillo plants that weren’t making fruit at all? Well, they finally are. I suspect they will be pea-sized by the time the first killing frost comes along. Right. Start these way earlier next year. Oh, and my friend S, who knows way more about all this gardening stuff than I do (OK, pretty much everybody knows more about gardening than I do) tells me to cut off the suckers from the tomato plants – much less likely to topple over under its own weight, and more energy devoted to making delicious fruit. Duly noted. I finished the BSJ for my nephew. 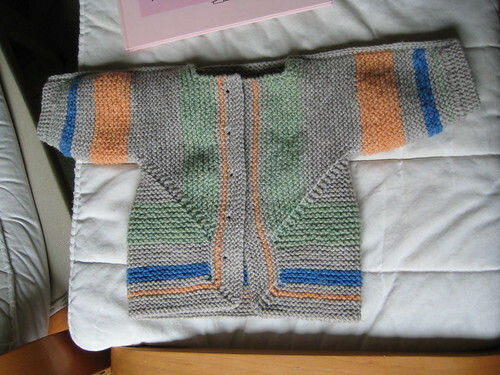 I’m so proud – it’s all made from stash yarn. I just need buttons. Where does one get buttons around here now that Cloth and Clay is closed? Len’s Mill? Online? Does Shall We Knit have any? I’d forgotten how much fun these are to make. I might have to dig out more stash and make another one. And, I nearly forgot. 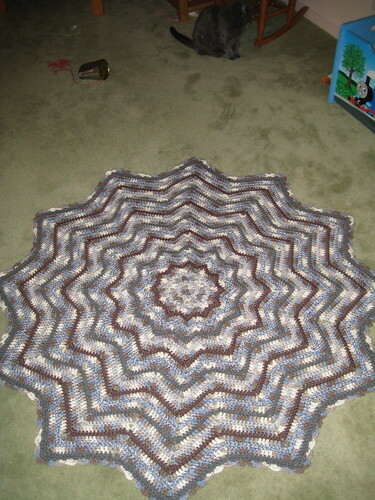 I finished that circular afghan for Spinrite. It worked up fast, but it still just looks like a messy, thick tablecloth. I did enjoy the scalloped edging, though. I hadn’t done that one before. Zebula turned six on Friday, which seems ludicrously old to me. We celebrated on the actual day, along with the Thingo family, with a white cake with lemon icing and sprinkles (per Zebula’s request), and then on Sunday with a bunch of little girls and a chocolate butterfly cake (again, as requested). 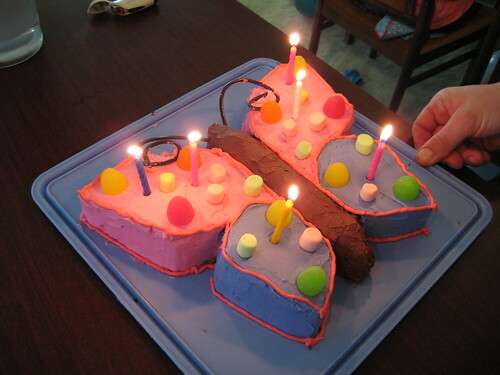 The butterfly cake was fun, and way less work than the Blue cake I made two years ago, but I was obviously feeling a little unsteady, since the pink lines look like they were drawn on by a drunk person (which I was not). Also, my mother-in-law did mention (in a nice way) that the middle part kinda looked like a turd. And I thought I was so clever because I was using chocolate icing I’d frozen from some previous cake. I couldn’t shake the turd thing, and that’s all I saw from there on in. But the girls didn’t care and all had seconds (apologies to the parents). I’ve been knitting a lot, which is weird considering how busy we’ve been around here. 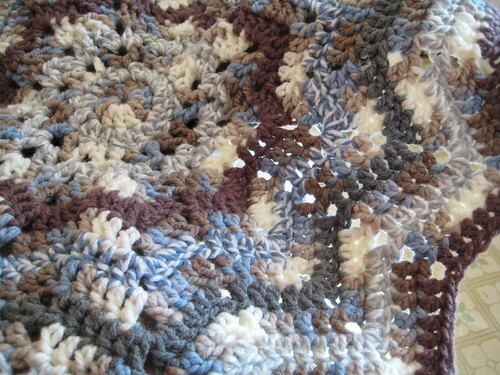 It’s a circular afghan, in five colours of Bernat Softee Chunky (one variegated, two solid and two ragg). Not enjoying this one at all – the yarn is very plastic-feeling, and the colours are just messy. 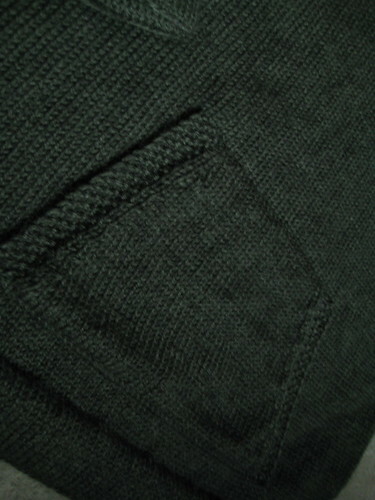 However, the actual stitch pattern is nice. But I don’t get it. Why does anybody want a circular afghan?? Isn’t that just a really fat tablecloth? Somebody, please, enlighten me! This is the Mystery Shawl, created by Marilyn Everington, fellow KW Knitters Guild member. It’s a triangular shawl worked from the outside in, which means I cast on 412 stitches to start, and it’ll seem interminable at the beginning, and rapidly go faster and faster as the rows get shorter. 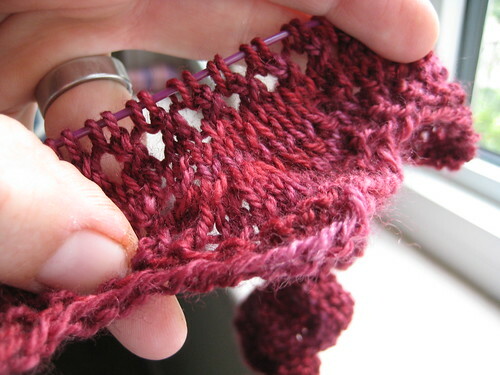 It’s a nice feather-and-fan pattern so far, and I liked working on it. The yarn is Fleece Artist Trail Socks, purchased at the Knitters’ Fair last weekend. After a false start with errors in the pattern, it worked up surprisingly quickly. Now I’m going to go tend to Vorlon, who’s getting into mischief to get my attention again. Sheesh. I have been wearing socks this week, as the weather is cold. Well, it’s cold in the morning. Yesterday afternoon was glorious. But I digress. I’ve worn nothing but handknit socks all week. They’re really nice. This morning, I put on socks I bought I Reitmans, and they’re not nearly as comfy. Guess I’ll have to make more. They’re very pretty and incredibly soft. I think I mentioned in a previous post that these are plain socks, using my internalized pattern. 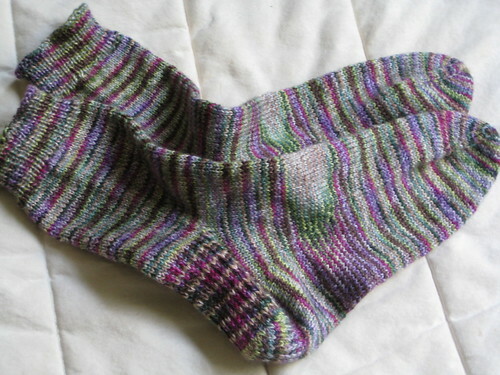 This was false – I actually used a variation of Cat Bordhi’s Upstream pattern (Ravelry link, sorry), only instead of putting the gusset increases in the centre of the instep, I put them immediate next to the sole. Looks nice, and they fit well too. However, due to my chronic inability to take notes, the second sock is a very slightly different circumference than the first sock, but only in the leg, and I can’t be bothered to rip down and start over. They fit well enough. On to mittens for the kids. It’s getting chilly out there! 1. My bike shoe got stuck to my pedal yesterday. This put me in the awkward situation at the bike rack of my local grocery store of actually having to take my shoe off to get off my bike (with Vorlon asking what I was doing about a zillion times). If you are curious, one of the screws fell off the cleat of my left shoe, making it all loose, so I couldn’t twist it to take it out of the pedal. I ended up taking the shoe off, as I mentioned, and then turning it around and around so as to unscrew the second screw. I then put the shoe back on, leaving the cleat in the pedal, and ran my errands, biked home, looked for the original pedals for my bike and found only one (not helpful), had lunch, biked Vorlon rather awkwardly to preschool, then went to the bike store. I’ve been meaning to change the pedals on my bike for about 6 years now. Since most of my biking now is errand- and shuttling-children-to-activities-related, I didn’t really need the bike shoes. So when I went to my local repair shop, I was prepared to get regular pedals (possibly with toe clips, since I like to be able to pull on the pedals as well as push, especially for long distances) and give up on the bike shoes until I find the suitcase full of money in the attic and get myself a road bike for long distances. Turns out they didn’t have any. But they did have a kind of hybrid. On one side, they are flat, like regular pedals. On the other side, they have the doodads to clip your shoes into. Everybody wins! It took them all of five minutes to install the new pedals and the new cleats. Now I can wear my stylin’ shoes to bike. And my bike shoes if I ever go riding again. This makes me ridiculously happy. 2. Yesterday was the first meeting of the Knitters’ Guild for the ’08-’09 season. (see? September really is where the New Year should begin) I’ve been going for about four or five years. Every meeting, there is a raffle. You pay $1 for three ballots, and they use the ballot money from the previous meeting to buy neat stuff to raffle off at the next meeting. I have never won. I enter every month, and never win anything. Well, I won yesterday! A nice ball of sock yarn, which will make socks for Dr. Thingo to placate him about me getting yet more yarn. 4. 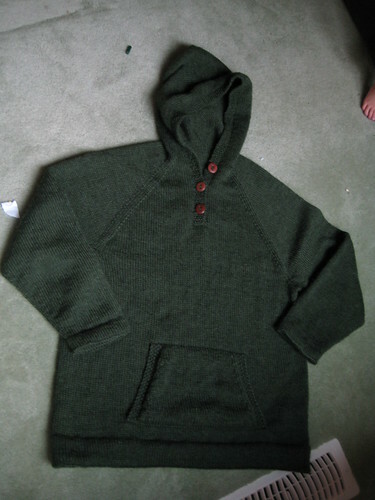 I finished Brother-of-Thingo’s sweater! And I love it! The pocket finally worked itself out, and I redid the button band/hood border both because I didn’t like the way it flared out and because the buttonholes weren’t vertically centred. Now it’s worth giving away. 5. The Large Hadron Collider got fired up last night, and, as expected, the universe didn’t collapse in on itself. According to Dr. Thingo, some of the scientists involved have been getting death threats from people who believe this is going to be the end of existence. Which I think is pretty funny, since if what they fear is true, they don’t need to kill anybody, since the LHC is going to do it for them. 6. I’m a little discombobulated because the playgroup that I have been going to every single Wednesday, save for maybe 10 times, since Zebula was 5 months old has moved to Thursday. My week is all thrown off. 7. I took up running about six weeks ago. I need to lose weight. I have a fairly active lifestyle, and I don’t eat too much junk food, but apparently it’s not enough. Since the simple formula (input < output) indicates that maybe I should burn a few more calories and running is the best bang for your buck time-wise, that’s what I decided to do. I googled “running for beginners”, and found a 10-week plan that gets you from running 2 minutes, then walking 2 minutes five times (which felt like my lungs were going to collapse) to running for 30 minutes. I’m currently on week 6 (running 8 minutes, walking 3 minutes three times). However, five and a half weeks later, I haven’t lost any weight, nor do my jeans feel any looser. Sheesh. Mind you, while it’s still not my favourite, it’s not torture anymore, and I like being outside alone in the park at 7:15 in the morning. Whew, that was long! Time to make a school lunch. Writer’s note: I meant to post this a week ago. And then I forgot to hit Publish. So here it is. I now have a first-grader. She went off to school yesterday with no fuss. It seems so grown up, somehow. She was totally wiped at the end of the day, and then after about 45 minutes of resting, ran around the house like a maniac until bedtime. I guess it’s mentally tiring, but not so much physically anymore. Vorlon doesn’t start preschool until Monday, so he’s been hangin’ with me. It’s been nice, actually. Yesterday, I ran a bunch of errands and did a lot of preschool-related work, and he tagged along and was very cooperative. Today, I’ve been cleaning (’bout time, too), and he’s been very happily playing by himself, with the occasional story reading and bathroom break. I haven’t knit anything for two days. I know. Crazy. But I’ve been busy gearing up to the start of preschool. I’m on the board as Membership Officer, so this time of year is very busy. And also, my hands are still sore, so I’ve made a conscious effort not to aggravate things. I hope it’s not the start of rheumatism or something equally unpleasant. I really do think it’s just too much working on Brother of Thingo’s sweater at one time. I’m doing the front pocket, and I’ve started over a bunch of times, and I have the whole weight of the sweater to deal with, so I think I just strained my hands. 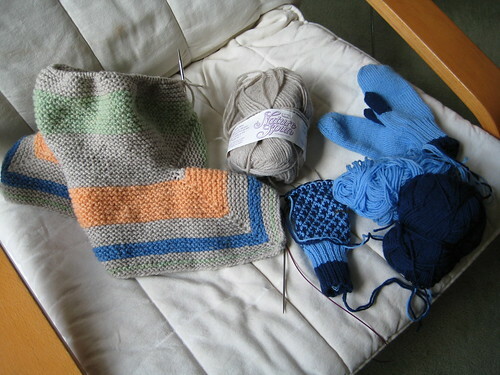 But, I have gone on Ravelry to check what kinds of other pockets people have done, so I think I’m ready to tackle it again. I’m going to go join Vorlon in the backyard with a glass of fizzy water and my knitting and listen to the cicadas while they’re still around. Oh, and choir starts again today. Yay!